One of the things I always enjoy about late summer in the U.S. is the amount of delicious locally grown fruit and vegetables that are available. This year, I’ve been eating fresh California figs, Colorado peaches and apricots, Blueberries from Oregon and some amazing watermelons and cantaloupes from Colorado. Most of the time I enjoy these fruits by themselves, but every once in a while I add a little bit of raw organic tahini to them for an extra calcium and fat boost. 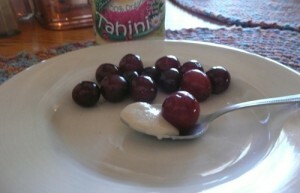 By far my favorite fruit to eat tahini with is fresh organic grapes. I’ve been enjoying that combination all summer and am happy that my 1 year old daughter also like it. There are many health benefits associated with eating raw tahini and grapes – here are some of the best. As long as you get raw and organic tahini, it has several health benefits of note. Finally raw tahini contains two special kinds of lignans (fiber) called sesamin and sesamolin. These fibers have been seen to help lower cholesterol and to prevent high blood pressure. To make an ultra healthy snack of raw tahini and grapes, I simply grab a 1/2 teaspoon of tahini and put a grape on top and then enjoy the taste explosion in my mouth.